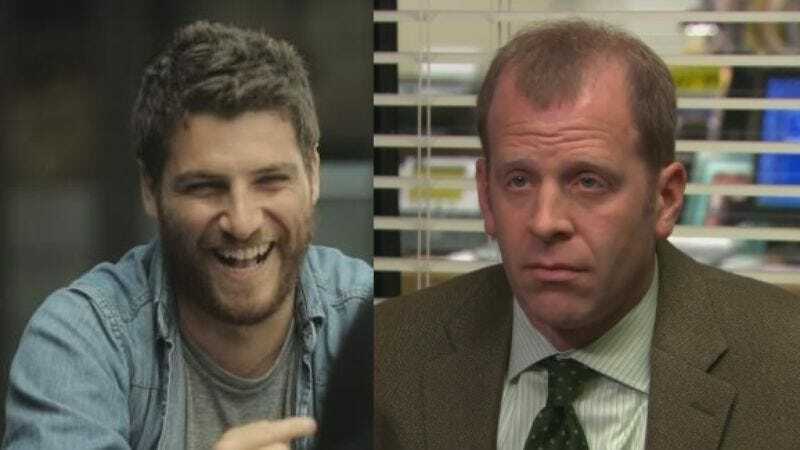 Following comedy writer instincts as old and irresistible as the flowing of the tides, or the urge to write a movie about a funny hitman, Adam Pally and The Office’s Paul Lieberstein have teamed up to create a spy comedy show that they’ve successfully sold to Fox. The untitled series will presumably serve as a repository for all of the jokes about shoe phones, ridiculous gadgets, and supervillain cliches that naturally build up in the comedy writer’s mind, and must be disgorged once every few years lest sickness and psychosis set in. Pally is better known for acting roles on shows like The Mindy Project than as a writer; his previous behind-the-keyboard work includes a few short films and an episode of NTSF:SD:SUV. (A show that’s practically a secret agent series already, suggesting that Pally may be deep within the thrall of spy comedy lust.) Lieberstein, meanwhile, served as showrunner on the Office episode “Threat Level Midnight,” meaning that he’s coming dangerously close to Goldmember levels of spy comedy exposure. The pair have reportedly recruited Younger co-star and frequent Improv 4 Humans panelist Jon Gabrus to co-write and maybe star in their series, and hopefully help them purge these dark impulses from their system, allowing them get back to the honest work of workplace comedies and relentlessly situational romcoms.